My original plan was to write my thoughts here in a cafe near my offices (both old and new) with a nice and close-up view of the Manila Bay however, lately I’m feeling uninspired so doubts if I will be able to write something clouded my head. I then just decided to finish a book by P. Coelho which I’ve been reading for a year or so. Not that it’s not interesting. It is. I wanted to finish it since day one but life has taken me away from the things I love to do such as reading, writing and crafting. Though I’m still grateful for the greatest joy my first born is giving me. Everything is worth it for my dear son, but I still miss nourishing myself. Who wouldn’t? Sometimes, I ask myself, how can I become a god mom if at times I feel incomplete. Just like most employees, sometimes I no longer feel happy or fulfilled with what I do and the desire to quit is becoming too strong to ignore. They say you have to stop doing what makes you unhappy and miserable for life is too short but it takes a lot of courage and money to be able to do that. I wanted to quit but I’m not gutsy enough to do so because my greatest fear is to have empty pockets. I’m positive still that things will get better sooner than I expect and I’ll be the happiest girl. After all, I believe that in life, there are really no mistakes unless you harm or hurt others or you defy the Big Boss’ rules. There’s a voice telling me to quit for what I’m born to do is coming but I say wait, bring me first what I’m made to do before I give up what I’m doing. Anyway, back to the book, I forgot it in my hubby’s bag, so I ended up doing my original plan aside from catching up with my Bible Applications. Coffee Jelly Frap. Banofee Pie. Bay View. Yachts. Sun. Book. Pen and Paper. Smartphone. PERFECT! Or not so? In my imagination it was a huge and very colorfully bright sunset with cool wind breeze but I’m here at 10:30 AM when Mr. Sun is at his mightiest. Surprisingly, the moment still seems to be perfect . I look around and all others seem to be doing what I’m doing, catching up with ourselves and thinking what I’m thinking, life.We all seem to have but one purpose. That is to stay sane amidst our crazy busy lives. All of us seem to be unmindful of what’s happening in the world. This is what we came here for. This is what we paid for, I PAID FOR. Not only the drinks, food, music and ambiance but the time-off, time-out from a fast-paced world we’re living in. Breaking free from all the uncertainties and worries. If there’s any luck I might just figure out what’s best to do next. Most importantly, this is the time to think of Him, my Big Boss and to talk to Him, to yearn and seek for His divine plans for me and my family. So what is the essence of this escape? 1.) Motherhood (especially the first time) can sometimes be too overwhelming that women forget about themselves which is not healthy. It brings out our greatest joys and fears. I felt I had to do something, hence this time-off. 2.) Reading books, writing stuff and crafting are my ultimate loves but I know I can live without them. Knowing your priorities is not enough, it should be clear with us, meaning with acceptance and genuine application. However, not being a priority doesn’t mean we’ll just forget about them forever. Remember how enjoyable it is to do fun things spontaneously, it’s good for the soul. Spend some time doing what you love to do as well even if it does not fit your priority list. 3.) Time management/budgeting is no easy feat. It’s a tough lifelong challenge to anyone. But its very important for us to find or make time for everything and everyone that truly matters to us. I include my self on this list and my Big Boss above all to whom I’m 100% accountable. 4.) Trust that every now and then life will turn a new leaf. Just hang on, pray hard, play nice, live in the present, work for the future and be happy and grateful for what it was. 5.) Finish what I’ve started. No room for procrastination. Sure there will be excuses, but valid or not, it does not really matter anymore. What only counts is if we finished what we begun or not. I’m not a coffee person. I find cafes such as where I’m at too expensive when there’s a 3 in 1 coffee around. I only go here to meet and chat with friends. But with this new experience, my whole perspective changed. I was able to shut my door to the world and opened a window to my soul. 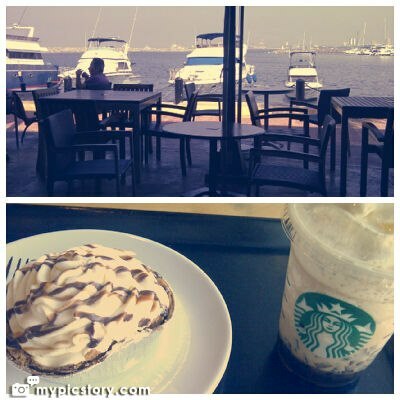 A few hours on this uncrowded, peaceful cafe with the perfect view of Manila Bay with its yachts and the wind breeze are all I need every once in a while to slow down and enjoy each breath. Soul feeds? Sanctuary? I’m happy I found mine.